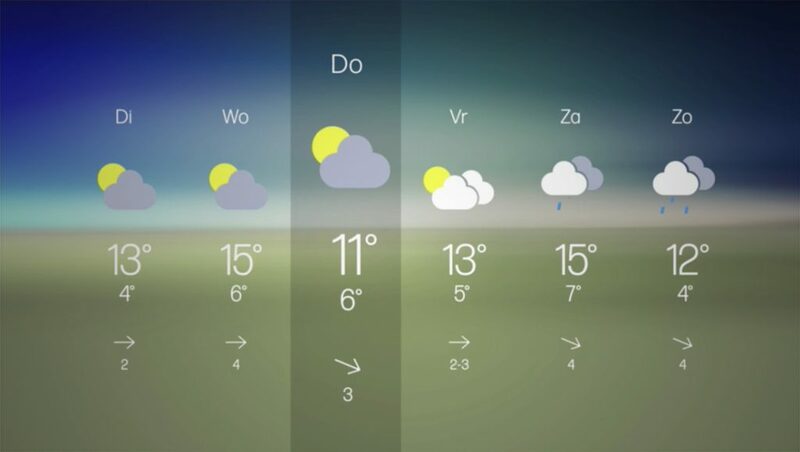 Europe-based broadcaster VRT is using a futuristic virtual weather set that combines structural elements and traditional weather maps to create a stunning and easy to understand presentation. The graphics are based around a floating L-shaped “frame” that floats behind the forecaster and the background, which can be a generic background or picturesque outdoor scene. Another unique aspect of this implementation is the extensive use of camera moves that let forecasters refer to maps and other graphics set “inside” of either side of the frame. Additional data can be included with floating rotating cubes. Interestingly, the look here sheds the notion of a frame and instead extends the graphics to all four edges of the screen without any of the traditional blocky columns seen in this type of graphic, with a darker overlay bar used to highlight a specific day. Like many of the more successful virtual reality sets, VRT’s weather set suspends reality in a way that actually improves how the graphics look. For example, the floating frame would be essentially impossible to do in the real world — and it’s that very lack of realistic nature that makes it so successful. While VRT does include outdoor scenes behind the virtual frame, the shiny virtual platform in the virtual set serves as sort of a boundary between the real and virtual. This imagery is viewer contributed. “We tested the opportunity of a network of enthusiastic amateur weather photographers to provide us with daily weather footage and the result was quite satisfying,” said Ken De Keyser, creative director at VRT.